Home » Blog » General Legal Matters » Going Through a Divorce ? Think about Protecting your Money ! It’s very important when you go through a divorce to have a handle of your finances and to know what your debts are and what you need to live. It is also equally important to protect your money and to make sure that now that you are separated that your ex has no access to your money nor can they increase your debt without your permission. Set up your own bank account and transfer your salary or other money that you receive directly into this account. If you and your ex have a joint offset account, you can speak to your Bank about setting up an offset account from your own single account. This is becoming more and more popular, where people have joint offset accounts and have separated. Think about closing or putting a hold on joint bank accounts so that your ex is unable to access money, which may be required to be divided later. You will need to consider this carefully especially where joint bank accounts are linked to home loan payments. If you wish to close your joint bank account, then make sure you contact your bank or go into your bank and find out what is involved and what closing or keeping the bank account means for you. If you do close your account, you will receive a final bank statement. If you don’t receive it, then follow up with your bank. You will need to sort out any regular debit and credit payments, so that you meet your obligations and make sure that you are not responsible for payments that you no longer wish to make such as monthly payments for gym membership for your ex. If you have joint credit cards and you are the primary card holder, then consider cancelling the credit card. You don’t want to be responsible for debts that have been generated by your ex. You also want to protect your credit rating and ensure that all your debts are being consistently paid and are not in arrears. This is not the time to let your credit cards to get out of hand. Re-set any shared Pins and Passwords so that only you can access your financial information and deal with your money as you require. You may also need to change email and mobile phone passwords to protect your information. If you are your ex have a mortgage or joint loan, contact your lender and let them know you are separated. 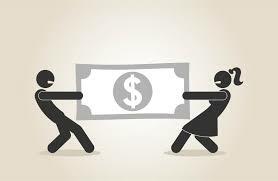 Discuss with your ex, how you intend to pay the mortgage or loan during the separation period. Unfortunately, it is not uncommon, for one party to feel that as the marriage or relationship has ended so too has their obligation to continue loan repayments. Family lawyers and Judges in the Family Court are often dealing with these situations, which adds unnecessarily to the stress and financial hardship of separated people. Find out whether you and your ex have a re-draw facility (this is where you can borrow more money against the equity of your home). If you have this then immediately contact to either cancel the facility or have both you and your ex sign before the facility can be used. Too often, when parties separate, one of the first things that happens is that the disgruntled ex-partner, cleans out the re-draw facility, leaving the other partner equally liable. Paying the running costs of you home, such as electricity, gas, strata and phone bills. If these bills are in your name only and you have moved out of the home, then think about how you will manage these payments. Contact the individual service providers and see whether you can get your name removed off the bill and transferred to your ex. If you are the legal owner of the property, this may be difficult for Council Rates and electricity, however if you contact them, they still may be able to assist. If you have no success, the payments that you make towards the upkeep and maintenance of property is considered as post-separation contribution on your part anyway, so your payments will not be disregarded. If you are not the legal owner of the home you and your ex live in, and you are concerned that your ex, may do something with the property to defeat your interest such as sell it or transfer it or increase the mortgage on the property, then you may be entitled to lodge a Caveat. Lodging a Caveat is only permitted in very specific circumstances and usually involves direct financial contributions being made to the actual property. The mere fact that you are separated and concerned that you will lose control of the property, does not permit you to lodge a Caveat. Even if you do go ahead and lodge a caveat, your ex can issue a lapsing notice, which means that within 21 days the Caveat will be removed and you will have no protection at all. This is an area where you should seek legal advice before lodging any Caveat. A final word of wisdom regarding money and divorce is simply that now is the time to get responsible about your finances. It is up to you, to know your money, to understand how your bank accounts operate and to be aware of what it will cost you if you don’t meet your financial obligations. There is nothing worse than ending a marriage and having to leave with a bad credit rating. Remember you will have a life after your divorce and you will want to get a credit card or a loan in the future, so please be responsible and don’t leave any loose financial ends, because they will come back to haunt you. This article is intended for information purposes only and is not legal advice. If you require legal advice then contact Cominos Family Lawyers on 8999 1800.